There’s lots of activity around the opening of “cruise season” in Venice, and citizens are mobilizing to continue to protest their presence. The cruise season resumes in full force the weekend of April 14 and 15: as many as 9 (nine!) ships will arrive and depart this Saturday and Sunday. The Comitato No Grandi Navi has decided to mobilize now, raising its voice to renew the demand to remove these monsters from the fragile lagoon. 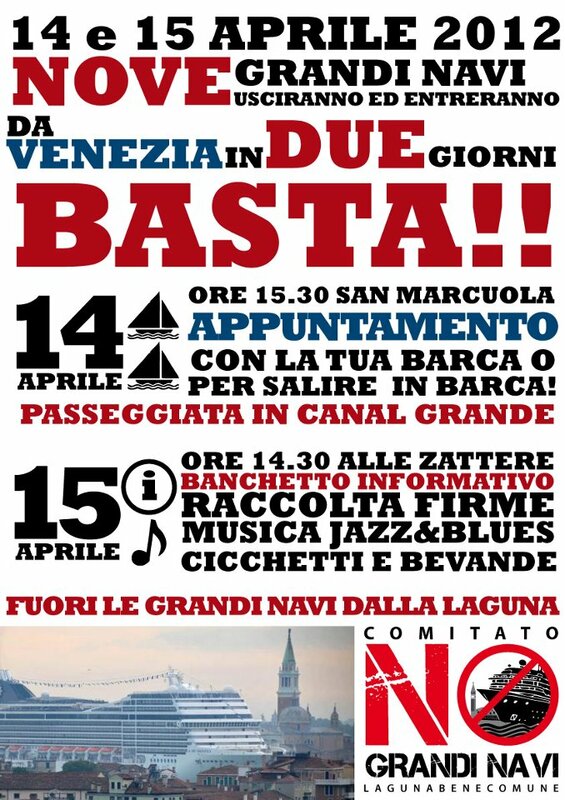 At 15:30 on the 14th, there will be a procession of private boats from San Marcuola to the Canale Grande Bacino of San Marco: citizens, in fact, are invited to repossess their water city in any sort of private boat: rowing, motorboats, sailing, pedal, canoe, kayak, or surfboard! Who doesn’t have a boat, or is on foot, will be transported by the Committee. It’s important that there’s a lot of us, to give the peaceful sign that we don’t need cruise ships to stay afloat in the lagoon, and that certain ships and the dredging they demand are incompatible, polluting, destructive. If anyone wants fly a flag or sign or banner that asks the cruise ships to stay out of the lagoon, obviously it would be welcome. Venetians, given free rein to your imagination! Then, from 14:30 on the 15th, we will set up a garrison along the Zattere with an information point, launching a signature campaign for the ouster of ships from incompatible lagoon. Drinks, cichèti, and jazz and blues music for everyone! Please join with us to proclaim that Venice belongs to its citizens, and not to the airlines or cruise ships or the Port Authority. This entry was posted in The Blotter, Vita Venexiàn and tagged cruise ships, demonstrations, protests, venice on April 13, 2012 by Living Venice. Good luck! If I were tomorow in Venice I would join you for sure. Many thanks. Nan…I would love to be there…..thanks so much for keeping us informed. I for one…..one who comes annually and stays for weeks…would be willing to pay an extra tax as a non-citizen…..just so these sea-beasts could be relocated!! Mars?? Wish I could be in Venice with my husband to raise a large banner and say NO cruise ships! We would gladly pay an extra tax during a stay to avoid having these ships endanger such a precious one of a kind place. Best of luck with the protest !! There’s a whole lot of us out here – who can’t be there in person, but who’ll be there in spirit – cheering everyone on. I will bang some saucepan lids together here (and frighten the neighbours!) in support. So, the Questura has prohibited the gathering of boats in the Grand Canal, fearing the disruption of traffic (even though it is not the intention). I think everyone who had planned to show up still will, even though the “official” gathering will be at the Salute at 4:15 – 4:30. I wish we could be there Nan, to show our support for this cause. Please report back to us.